Now that the leftovers are in the fridge, it’s time to start thinking about Christmas presents. 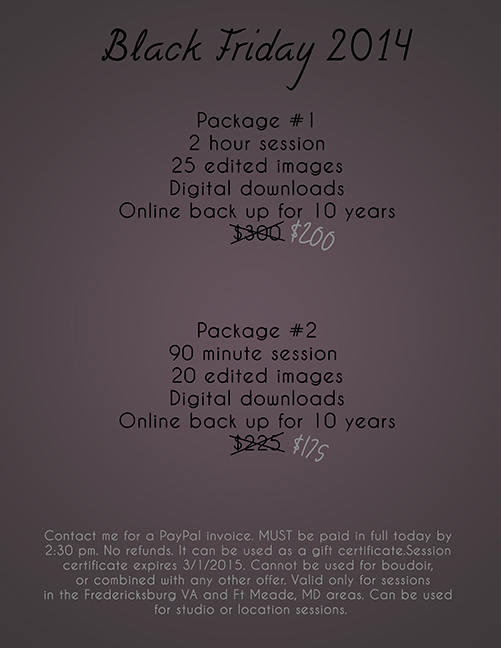 This year I’m releasing special session pricing for shoots through March 1st. It can be used for families, seniors, children, couples. They are not valid on boudoir sessions. Sessions must be paid for in full TODAY, November 28, 2014 by 4:30 pm. You do not have to have a date in mind, but this is valid only on sessions booked for before March 1, 2015. If you don’t use the session before then, what you’ve paid will turn into a retainer fee for a session and will go toward a full price session. All sales are final. How do you order? Simply email me with the email you’d like me to use to send a PayPal invoice. Once it’s paid, you’re good to go! All unpaid invoices will be cancelled at 6:00 pm EST.